Daniel Gibson – LHP – Florida – So. 2.1IP 4H 1ER 0BB 0K. 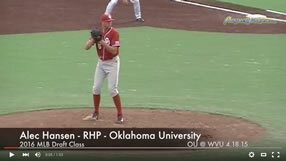 Greg Larson – RHP – Florida – Sr. .2IP 0H 0ER 0BB 1K. Matt Price – RHP – South Carolina – Jr. 6.1IP 7H 4ER 3BB 5K. (L, 2-1). Forrest Koumas – RHP – South Carolina – So. .2IP 0H 0ER 0BB 1K. Jerad Grundy – LHP – Kentucky – Jr. 5.2IP 7H 3ER 3BB 3K. Kentucky takes the series against the 2 time defending champs and moves to 20-0. They’re legit. Trevor Gott – RHP – Kentucky – So. 1IP 0H 0ER 0BB 2K. Ryne Stanek – RHP – Arkansas – So. 5.2IP 5H 2ER 3BB 4K. (W, 5-0). Ryan Eades – RHP – LSU – So. 7IP 8H 1ER 1BB 2K. (W, 4-1). Matt Grimes – RHP – Georgia Tech – So. 2.2IP 5H 4ER 1BB 3K. (L, 3-2). Carlos Rodon – LHP – North Carolina State – Fr. 8IP 4H 1ER 2BB 9K. (W, 4-0). Ross Stripling – RHP – Texas A&M – Sr. 9IP 6H 2ER 2BB 8K. (W, 3-0). Jonathan Gray – RHP – Oklahoma – So. 4.1IP 8H 5ER 2BB 2K. (L, 2-3). Damien Magnifico – RHP – Oklahoma – Jr. 1.2IP 0H 0ER 0BB 2K. Ricky Jacquez – RHP – Texas – Fr. 3IP 3H 3ER 4BB 1K. Hoby Milner – LHP – Texas – Jr. 3IP 5H 1ER 0BB 2K. (W, 3-3). Corey Knebel – RHP – Texas – So. 2IP 1H 0ER 1BB 0K. Konner Wade – RHP – Arizona – So. 6.1IP 7H 3ER 1BB 4K. Justin Jones – LHP – California – Jr. 5IP 7H 4ER 2BB 3K. (L, 2-2). Ben Wetzler – LHP – Oregon State – So. 8IP 6H 2ER 2BB 4K. (W, 4-0). Jake Reed – RHP – Oregon – Fr. 8IP 8H 4ER 2BB 3K. (L, 1-2). Jeff Thompson – RHP – Louisville – So. 6IP 5H 3ER 3BB 6K. (W, 4-0). Matthew Reckling – RHP – Rice – Jr. 6IP 3H 1ER 2BB 13K. (W, 3-0). Dominating performance. Eric Skoglund – LHP – Central Florida – Fr. 5IP 2H 0ER 1BB 7K. (W, 3-0). Garrett Nuss – RHP – Central Florida – Fr. 4IP 1ER 0ER 1BB 5K. (S, 1). Dan Langfield – RHP – Memphis – Jr. 5IP 6H 3ER 2BB 8K. (W, 4-1). Nick Grim – RHP – Cal Poly – Jr. 1IP 2H 1ER 1BB 1K. Matt Imhof – LHP – Cal Poly – Fr. 1IP 0H 0ER 0BB 1K. Andrew Mitchell – RHP – TCU – So. 4.1IP 3ER 2ER 1BB 4K. (W, 1-2). Austin House – RHP – New Mexico – Jr. 7IP 4H 0ER 2BB 4K. Zak Qualls – LHP – UNLV – Fr. 5IP 4H 5ER 4BB 4K. (L, 2-1).